To bring home limits of panfish this spring, don’t leave home without VMC® Hot Skirt Glow Jigs and Trigger X® Boot Tail Minnows and Curl Tail Minnows. Target shallow reed edges in lakes with the former. Throw the latter in river backwaters. Throw each on 4- to 6-pound Sufix® fluorocarbon line. So says panfish fanatic Joel Nelson, a Rapala Pro-Staffer and popular co-host on the influential In-Depth Outdoors TV show on Fox Sports North. Crappies begin to spawn when water temps near 60 degrees. Before that, they begin actively feeding in around shallow cover, like reeds, brush and downed trees. 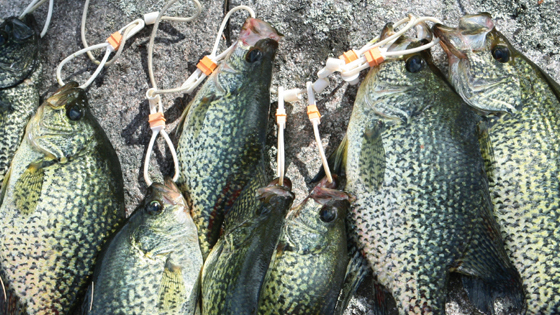 And while there’s no “magic number” to signal when crappies will begin putting on the feedbag, action generally heats up when water temps reach 48 to 51 degrees. That’s when Nelson ties on a VMC Hot Skirt Glow Jig and starts scouting shallow reed beds. Featuring unique glow-in-the-dark skirts and flashabou fibers, Hot Skirt Glow Jigs help turn early-season lookers into biters. Start looking in shallow water close to “where you caught ‘em in the winter,” Nelson says. “Basically look for the areas in the same part of the lake that are adjacent and just a little shallower, back in the back of the basin.” Although four to six feet of water is usually plenty shallow, “fish can sometimes be found in a few inches,” he says. Hot Skirt Glow Jigs feature high-carbon steel hooks. They come two per pack in five sizes: 1/32 oz (size 6 hook), 1/16 oz (size 4 hook), 1/8th oz (1/0 hook), 1/4 oz (2/0 hook) and 3/8 oz (2/0 hook). They are available in 14 color patterns: Black Chartreuse, Blue White, Chartreuse Lime Green, Chartreuse Orange, Chartreuse White, Crappie Minnow, Hornet, Pink Pearl, Purple Albino, Red White, and four new patterns, Blue Fire UV, Green Fire UV, Orange Fire UV and Pink Fire UV. For spring crappies, Nelson favors Red White and Pink Fire UV. In Mississippi River backwaters, Nelson targets panfish with Trigger X Boot Tail Minnows and Curl Tail Minnows rigged on VMC Boot Tail Jigs and Curl Tail Jigs. Featuring long, micro-thin mid-sections terminating in a boot-shaped tail paddle, Boot Tail Minnows swim with a light and subtle vibrating action. Boot Tail Jigs pre-rigged with Boot Tail Minnows are available in two-packs. Both the jigs and soft baits are also sold separately. Featuring a long, micro-thin curly tail, Curl Tail Minnows swim with a light and subtle twirling action. Curl Tail Jigs pre-rigged with Trigger X Curl Tail Minnows are available in two-packs. Both the jigs and soft-plastics are also sold separately. Boot Tail Jigs and Curl Tail Jigs come in two sizes: 1/16 oz. (with a size 4 hook) and 1/32 oz. (size 6 hook). Each features a Power Gap hook and 90-degree hook eye. Each is available in two natural color patterns — Crappie Minnow and Mayfly — and six Ultra Glow patterns: Glow, Green Orange Glow, Orange Chartreuse Glow, Pink Chartreuse Glow, Glow Chartreuse, Glow Red. Ultra Glow colors will glow for as many as 15 minutes after charging. As spring turns to summer and weeds push out into deeper water, the fish will follow, leaving their shallow, spawning locations. As they do, Nelson says, you can continue to target them with Boot Tail Minnows and Curl Tail Minnows. This entry was posted in News, Pro Staff, VMC and tagged Boot Tail Minnows, Castable Invisiline 100% Fluorocarbon, Curl Tail Minnows, Hot Skirt Glow Jigs, Joel Nelson, Sufix, Trigger X, VMC. Bookmark the permalink.